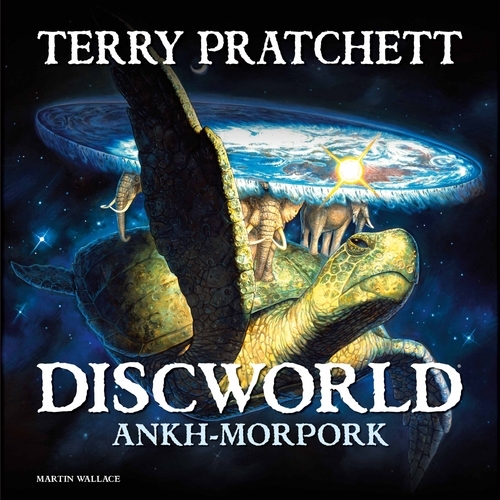 I was worried when I heard about the new Discworld: Ankh-Morpork game. Book, movie and TV-show themed board games often work better as something to round out the collection, rather than a game you’d actually want to play. Would this game live up to the Discworld name or would it be another version of Star Wars: Monopoly? For example, take the 2002 game, “Thud”, by Trevor Truran. Essentially, it was an abstract game with a Discworld costume thrown on top. Imagine a game of chess where your side is made up of one piece only, but different from your opponent’s. It had some interesting mechanisms and was by no means the worst game in the world, but it didn’t shake my world either. It was the type of game that would probably require several plays before you really got into swing of it. Unfortunately by that time you’d probably also realised that it wasn’t very fun. My worries left me when I discovered that the designer of Discworld: Ankh-Morpork was Martin Wallace. Wallace is best known as the creator of complex economic games such as Brass and Automobile. A wonderful designer for sure, but would his style of game really fit into a Discworld theme? Fortunately, yes. So how does “Discworld: Ankh Morpork” work? Each player (2 – 4) takes on the role of a Discworld character, such as Commander Vimes or Lord de Worde and attempts to take control of the city. You see, Lord Vetinari has disappeared and there is a power vacuum that needs to be filled. This is an area-control game. The game board is a (wonderfully drawn) map of Ankh-Morpork, divided into twelve areas, such as Nap Hill, Unreal Estate and The Shades. Players have a hand of cards based on Discworld which allow you to perform various actions which can include spreading their minions across the city, constructing buildings in different areas or even performing the noble art of assassination. Sergeant Colon, for example, lets you remove trouble from an area and place a minion, whereas Death lets you perform two assassinations and then place a building. Too much activity in an area can lead to Trouble and careless play can lead to dragons, demons or, far worse, Bloody Stupid Johnson. Owning buildings grants players special powers, but only one building can exist per area so there is often a struggle to be the first to build. What really makes this game shine is how the secret missions work. Each player’s character is kept a secret until the end of the game and each has a mission to complete in order to win. For example, Chrysoprase needs to bring his net worth up to $50, whereas Vimes simply needs to prevent anybody else from winning by the time the cards run out. As the missions are kept secret, you must use deduction to determine who the other players may be, and obfuscation to hide your own identity. Players need to be on the lookout for every single victory condition that might be near completion. Clever players might try to meet more than one to throw off the others. By far, however, the best feature of this is the fact that your victory conditions must exist at the start of your turn. This means that not only do you have to achieve your goals to win, you have to hope that nobody else manages to ruin them before your next turn. This creates a very tense atmosphere. In a four-player game I played I met my goals three times but had to watch my opponents tear my plans apart twice before eventually winning. Some may not like the random element to the game, but others will find that it lends itself perfectly to the Discworld theme. 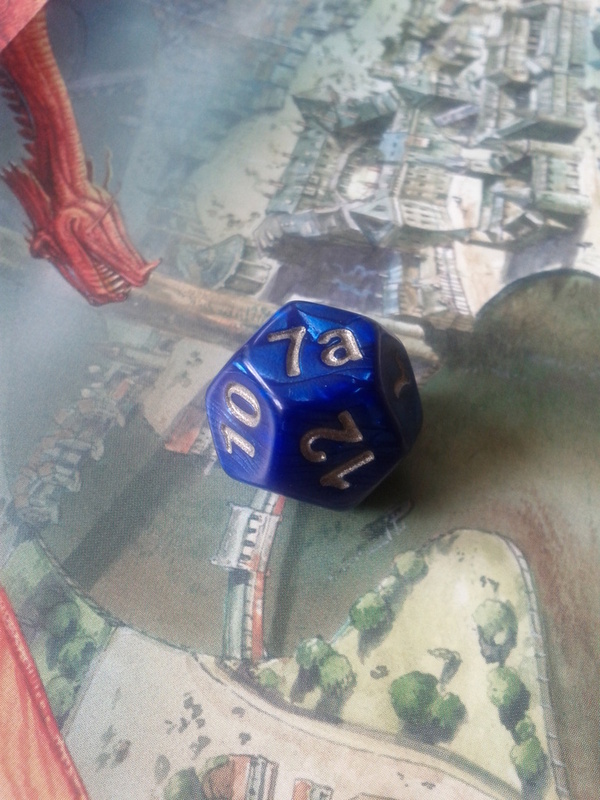 There is a twelve-sided die included with the game that leaves out the number that cannot be named (it’s the one between seven and nine) and instead bears the mark ‘7a’. I’m sure most Discworld fans will appreciate this touch. For those of you familiar with Wallace’s work, you may have realised that this game is remarkably similar to London, which only came out in 2010. 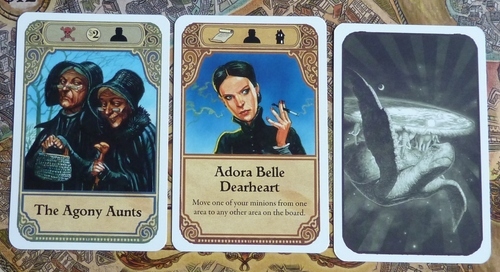 In fact, Discworld: Ankh-Morpork is clearly based entirely on London, with a few extra features thrown in. London isn’t as cut-throat, but is slightly less luck-dependent. 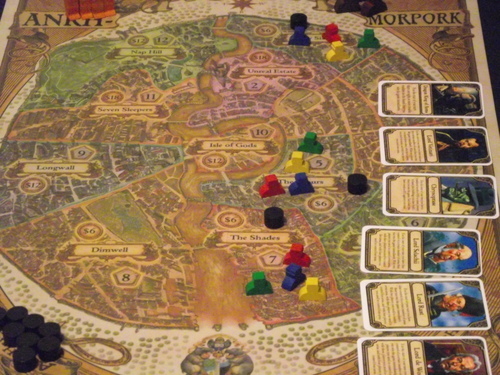 Discworld: Ankh-Morpork is a lot of fun, well suited to an evening of laughter and betrayal among friends. Best suited to a laid back, light-hearted group of gamers, this game is well worth a look. This entry was posted in Gaming (Board), Reviews and tagged Ankh-Morpork, board game, Discworld, martin wallace, paul kidby, Terry Pratchett. Bookmark the permalink. This looks even better with extra added iconographs. Well done!